Whether you are a hunter, a survival and camping enthusiast, or just a guy who loves the great outdoors, you cannot afford to be without a knife. This handy tool is not just for cutting and slicing. In fact, a good knife can be used for digging, splitting, building shelter, prying, building a fire and even administering first aid. As such, a knife is a multi-purpose tool that will make your outdoor excursion the more enjoyable. Nevertheless, just because a knife is marketed as the best camping knife or best survival knife does not mean it is the best. Therefore, you must be very careful when selecting your next camping knife. To make things a little bit easier for you I have written this article with the intention of helping you choose the right knife for your outdoor needs. In it, I have highlighted some of the important factors to consider when buying a best camping knife. Additionally, I have compiled a list of the ten most popular and best camping knives on the market. But before we get to the reviews below is a quick comparison chart of our 10 top camping knives! So lets jump into it. So, what should you look for in a camping knife? This is the question this buying guide section seeks to answer. Sure, a 7-inch blade sounds impressive, but do you really need such a long blade for camping? Of course not, especially given that you will be using the knife mostly for carving snares. However, an overly small knife will not do either. The best camping knives usually have a blade length of 3 to 4 inches. In other words, medium sized knives are better for precision cutting, which is what you will be doing a lot of when camping. There are two types of steel used to make camping knives, carbon, and stainless steel. Each type of steel has its perks, and it depends on what you are willing to compromise on. While carbon steel knives are easy to sharpen and firm, they are prone to corrosion. And this is why they are cheaper than stainless steel knives. Due to stainless steel being resistant to rust, stainless steel knives are easier to maintain and cost more. Overall, if you are on a tight budget, there is no harm in buying a carbon steel knife. Nevertheless, if you can afford a stainless steel knife, I recommend buying one. The question of serrated vs. non-serrated camping knives really comes down to preferences. Personally, I prefer non-serrated knives. This is because non-serrated knives are more comfortable to sharpen and there is no worrying about chipping teeth. Thus, while serrated knives can cut through almost anything their non-serrated knives are better in my opinion. This is especially when you consider that a well sharpened and high-quality non-serrated knife can also cut through anything. Similar to blade length, weight is another important factor to consider when buying a camping knife. Ideally, a camping knife should be as light as possible. A knife that weighs more than 4 ounces cannot be considered a camping knife let alone the best survival knife. Some campers will tell you never to go for a knife with a synthetic handle. While they do have a point, it is important to point out that not all synthetic handles are weak. Apparently, a wooden handle is better than a synthetic one, but do not be so quick to rule out a synthetic handle. If a handle is durable, rugged and made to last, it will do. And as I have found out there are some pretty durable and sturdy synthetic handles out there. When searching for the best all around camping knife, it will be useful if you know what the best camping knives are made of. In other words, the characteristics of the best camping knife. The best camping knives have several distinguishing qualities and here are the main ones. Lightweight: The best camping knives are usually the lightest. This makes them easy to hold and carry. Medium sized blades: as stated above, the best knives usually have medium sized blades ranging from 3 to 4 inches long. This makes them ideal for precision tasks. Single-edged: while there are a lot of double-edged knives on the market, they are not suited for camping. The best for camping are those with a single sharp edge and a dull spine. A single edge knife allows for more control. Handle: The best knives feature a handle with an obtrusive bolster, which prevents your hand from sliding down to the blade. Also, they come with finger grip points to improve grip. One of the most frequently asked questions about camping knives is which is better a fixed or a folding knife. In all honesty, there is no precise answer to this question as both knife types are suited for different situations. Fixed knives feature zero moving parts and are made from one solid piece of steel. This means they are sturdier and less likely to break. One of the best things about fixed knives is that they are durable and sturdy. Therefore, they are suited to rugged and tough tasks such as digging or prying. However, they are not without drawbacks, the main being that they are not convenient to carry. Folding knives, on the other hand, have foldable blades, making them easy to carry. They are often referred to as pocket knives. Due to them being smaller and foldable they are better suited to tasks that require skill and precision. One of the main drawbacks of these blades is that they can break due to heavy usage. All the same, in some states you are required to carry a knife folded. Thus, they are better suited for everyday carry. When deciding on which is the best knife for camping and hiking, you will have to consider what you will be using it for. If you need a knife that is tough and rugged for heavy use a fixed knife is better. However, if you want a knife for precision tasks a folding knife is better. Additionally, if your state has laws against carrying knives unfolded invest in a folding knife. Not every camping knife marketed as the best is actually the best. Personally, if I had to choose the best camping knife, it would be one of the following. I have grouped these knives based on what they are best suited for. Starting us of is the best fixed blade camping knife. 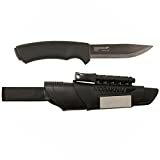 There are two camping knives that I believe are the best-fixed blade camping knives. These are; the Ka-Bar Becker BK2 Campanion Fixed Blade Knife and the Benchmade - Griptilian 551 Knife, Drop-Point. I have picked these two based on what users reviews as well as my own personal experiences. A fixed blade for camping needs to be strong and tough to handle any task. And this is what the two knives are. The Ka-Bar Becker BK2 has been hailed as the best-fixed knife for outdoor use. With such a reputation it was only fair for me to put this blade to the test. And though there are somethings I did not like about it, I must admit it is arguably the best knife for camping I have ever used. And here is why. The blade is made from cro-van steel, which is Ka-Bar Becker’s fancy name for carbon steel. The good thing about this blade is that it is razor sharp and does not lose sharpness easily. Also, the blade is ¼ inch thick, making it ideal for tough jobs. Moreover, it is safe to apply pressure to it without worrying about it getting damaged or breaking. Overall, the blade is 5.5 inches long. The handle on this blade is extremely ergonomic and tough. It provides a nice, smooth and balanced grip. As with most fixed blade knives, this knife comes with a sheath. The sheath is made from molded FNR nylon that is molded to resemble the shape of the knife. Thanks to this there is no noise when you are taking out the knife. Despite its weight and thickness, it is well worth the money. I found it to be extremely versatile and tough, so tough that it can be used as a mini-axe. This combined with its ergonomic design makes it a knife worth purchasing. The blade on this knife is made from high-quality stainless steel. This means it is impervious to rust. In addition to this, it is exceptionally tough and rugged, making it ideal for use in rough terrains. The handle, on the other hand, has a bellied design and a rubberized armor. This guarantees a firm secure grip even with wet hands. This knife is the perfect knife for camping and outdoor use. It has a 4.1-inch blade with a thickness of 2.5 mm. Overall, it measures 8.7 inches and weighs 4.1 ounces. In essence, it is lightweight and comfortable to hold. The best-fixed blade camping knife should offer a balance between price and quality. And this is exactly what the Morakniv offers. It is built for campers, hikers, and survivalist and comes with an incredibly affordable price tag. Thus, if you are looking for quality at an affordable price, this is the blade for you. 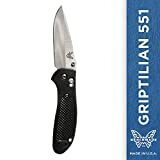 Benchmade is a company known for its high-quality knives, and the Benchmade-Griptilian 551 knife is no exception. There, not many folding knives that can match its quality. The 3.45-inch long blade is constructed using high-quality stainless steel. This means it is resistant to corrosion. Also, the blade is sharpened on both sides and can perform a wide variety of camping tasks. At the heart of the knife’s folding mechanism are an axis locking mechanism and thumb studs. This locking mechanism snaps open quickly with the flick of the wrist. If you are left-handed, then you are going to love this knife. Made from a glass reinforced polymer, handle offers a smooth, comfortable grip and has a tightly textured pattern. I found it fits well on the hand and feels very comfortable. If you want an everyday carry knife that will not get you into trouble with law enforcers, this is the knife for you. It small and lightweight, making it an ideal knife for carrying inside your pocket. It is arguably one of the best camping knives under 100. Folding knives are also great for camping. There are quite a number of camping folding knives out there, with the best being the Benchmade Bugout 535 Knife and the BRS Minuteman EDC Folding Knife. These two knives are small and compact and can easily be carried inside a pocket. This makes them the ideal knives for camping tasks that require precision. Due to their folding mechanisms that are prone to breaking folding knives are best suited to precision tasks. 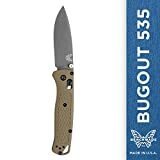 The Benchmade Bugout 535 hit the market in late 2017 and received rave reviews from users. So, when the year beginning this was one of the knives I was looking to buy. I finally bought my bugout 535 in February and here is what I think about it so far. The folding mechanism uses Benchmade Axis lock with small steel inserts on both sides. This locking mechanism is responsible for the knife’s ultra-lightweight. This small and ultralight weight knife was built for the modern day outdoor adventurer. It is ergonomic and extremely lightweight. And while it is not the best all round camping knife demanding tasks, it does excel at small tasks that require precision. The futuristic-looking BRS Minuteman folding knife is a one of a kind masterpiece that stays true to the traditions of everyday carry knives. Thus, while it does boast a futuristic design, it has all the features of a folding knife. As with all other camping knives, this knife features a steel blade. The blade measures 3.5 inches. Now, this is a short blade designed for tasks that require precision. One of the best things about this knife is the handle. It is super easy to hold and feels comfortable thanks to its ergonomic designs. With its features, this is arguably the best folding camping knife on the market. In fact, there is nothing like it. And while it costs considerably more than other folding knives, when you consider its features it is well worth its price tag. Being a swiss army knife, the Victorinox comes with a number of features, including a blade, nail file, scissors and even a screwdriver tip. When closed, the knife weighs 1.6 ounces and measures 2.25 inches. In this regard, you will hardly notice it when you slide it into your pocket. This is one of the things that makes it a favorite of hikers and campers alike. The knife has some pretty useful accessories that you can use. Included are a nail file, screwdriver tip and even a pair of scissors. It is thus the ultimate travel and outdoor companion. 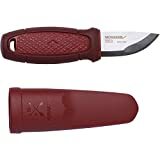 The Victorinox is the smallest knife on this list. However, given its useful features, it more than deserves a spot on my list. All the additional features it comes with are useful and come in handy when you need a multi-purpose knife for outdoor use. 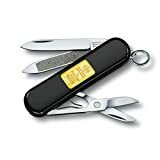 It is thus the best swiss army knife for camping on this list. As you have probably already guessed this is one of the smallest if not the smallest fixed blades out there. Overall it measures a mere 5.6 inches long. To put this into perspective, some blades have blades that measure 5 to 6 inches long. But do not let its small size fool you as this is a more than capable blade. Speaking of the blade, the Eldris has a small blade that measures 2.2 inches long. Made from stainless steel, the blade is resistant to corrosion and maintains sharpness really well. The sharp edge maintains its sharpness even after hours of wood carving. The one thing I was worried about when I picked up the Eldris was how comfortable it is to hold and use for long hours. To my surprise, the rubberized handle feels very comfortable and I experienced no fatigue using it for one to two hours. As with any other fixed blade, this knife comes with a sheath. And if you thought it is of low quality, think again. The leather sheath holds the knife securely in place and comes with straps. Despite this, I prefer the neck combo that makes it easy to hang the knife around your neck. This makes carrying the knife concealed easy. Is the Eldris the best pocket knife for camping? Yes. It offers the best combination between value and price. Additionally, it offers the convenience of a folding knife and the toughness of a fixed knife, which is a big plus. Thus, while you can use this as your main knife it is still a handy cutting tool to have while out camping. Camping sometimes requires a survival instinct as well as survival gear. And since the knife is one of the most crucial components of a survival kit it is a must carry for any camper. However, not all knives are designed for survival scenarios. That being said, the Fallkniven F1 is one of the best camping survival knives you can have. I like my survival gear military grade. So, when the chance came to test the Falkniven F1 survival knife, I could not say no. This small, but sturdy fixed survival knife is a wonder to behold. Built for Sweden’s harsh weather, this knife is a survivalist’s best friend. When I held the Falkniven F1 for the first time I was a little bit surprised at how minimalistic its design is. There is nothing sophisticated about it, in fact, it is hard to identify it when placed amongst kitchen knives, which is a good thing. The reason being that it does not draw unwanted attention. The Falkniven F1 is a real survival knife with a blade made from tough stainless steel that maintains its sharpness quite well. And that is not all, the spine of the blade has a sharpened edge, which is sharpened at a 90-degree angle. The drop-point design of the blade is another big plus as it allows for easy drilling of wood. Given it was built for Sweden’s harsh weather, the handle on this blade is amazing. For starters, it grips well and is easy to hang on to. I used the knife bare handed and I must admit it felt very comfortable and did not slip. The overall size of the blade is 8.3 inches, meaning it’s neither too small nor too big. It is just the right size. It fits nicely inside a daypack. The ruggedness of the Falkniven F1 is its best-selling feature. When compared to other survival knives, this Swedish creation is a class above the competition. Thus, while it’s minimalistic design might be deceiving, this is a world class blade designed for the survivalist in you. And while you will need the best camping knife sharpener, the Falkniyen is still a great knife. Considerably cheaper than the Fallkniven F1, the Gerber LMF 11 survival knife lacks the minimalistic design of its counterpart. Instead, the manufacturer of this knife opted for a premium look. The overall length of the knife is 10.59 inches, while the blade measures 4.48 inches. For a survival knife, this is the standard size. And given that it weighs 11 ounces, it is both portable and lightweight. Being a survival knife, the Gerber LMF has a blade-point blade. These types of blades are usually very strong. Thus, you can expect the knife to perform excellently in the great outdoors. Additionally, the blade is semi-serrated, which adds to its strength. The handle is made from a glass filled nylon. And while this is a synthetic material, it feels good to hold and as is easy to grip even with wet hands. Costing less than $100, the Gerber LMF is one tough little knife. It can be used to cut almost anything. This makes it the perfect companion for hikers, campers, and even hunters. And thanks to its affordable price tag it is readily available to all. The second Morakniv entry on my list is the Morakniv Bushcraft Carbon Steel survival knife. The latter is made by one of the best knives manufacturers, Morakniv. Thus, you can expect quality from this knife. As with any other Morakniv knife, the blade of this knife is made from high-quality steel. In this case, carbon steel and is 3.2 mm thick. This thick 4.3-inch blade is tough enough to perform demanding tasks and can cut through almost anything. When it comes to the handle, Morakniv opted for a textured rubber finish, which I have to say feels very grippy. The handle does not slip for your hand even in wet conditions, which is a big plus. The ergonomic design of the handle fits the palm of my hand well. Measuring 11 inches long, this is not a small knife. As such, it is not an everyday carry knife and you might be in trouble carrying it in some states. Nonetheless, its size is well within the survival knife standards. Morakniv is a company that has become synonymous with knives. As such, all knives produced by the company come highly rated, and the Bushcraft is no exception. While it is larger than most camping knives, it is strong and can cut through most things including wood. This makes it a handy companion for survivalists, campers, hikers and even hunters. When going camping, it is wise to always carry a knife. And not just any knife a camping knife. 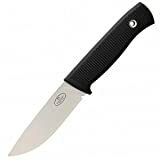 The above best camping knife review is the best place to start your search for the best camping knife. With all the options available it can be overwhelming. However, these knives are all great for camping.